Hi everyone! Scrubbing is a really great way to keep the skin smoother and prevent the blockages of skin pores. When the skin pores get blocked then that can lead to skin problem, pimple and cane. 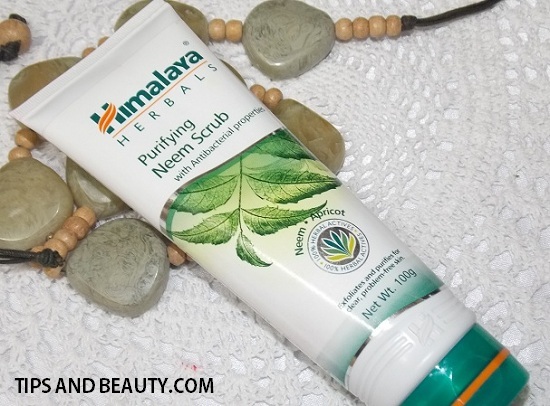 I will review this Himalaya purifying Neem face wash. Himalaya makes so many face scrubs like himalaya complexion whitening face scrub, face packs and face washes that I love to use them. This brand is one of my favorite brands of product that makes good products which suits my skin type. Anyways friends, let’s begin the Himalaya neem face scrub review. Price of Himalaya Neem face scrub : This is for 130 rupees for 100 gm tube and 75 rupees for smaller tube. 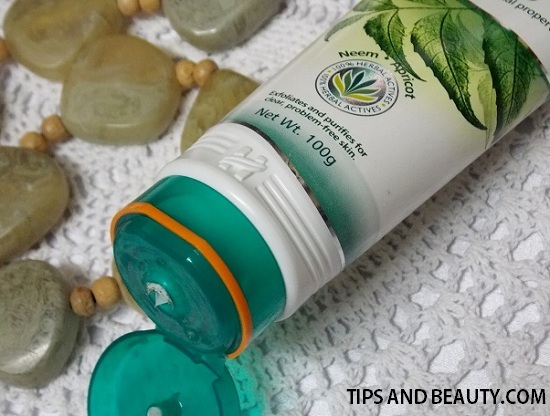 This Himalaya neem face scrub comes in a squeeze up flat tube with a green cap. This is the typical brand packaging of almost every Himalaya products. In fact I like this green and white combination of their packaging. Thiis facial scrub smell of the neem and some cream like. This doesn’t have any strong fragrance. I always restrict myself from using the strong smelling products as they can be extremely harsh and unsuitable for the sensitive skin types. This scrub has a light greenish color. A creamy base with dark green crystal or particles in this. These can be the neem particles. 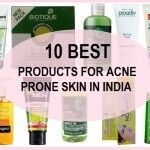 I like neem for skin care products. This is because neem is an antibacterial product which can very well eliminate the bacterial infection. 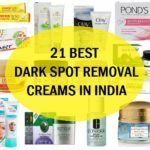 This is why I love to use neem based products. 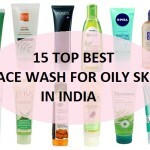 By the way Himalaya neem face wash is extremely popular and very good. So, this is a slight medium consistency. To use this Himalaya neem facial scrub, I will first of all wash my face with clean waste and then take around a coin size of this product I would then apply that on my forehead, nose, chin and both the cheeks. Then using my finger, I will start massaging the face like we scrub our face. I keep scrubbing for 2-3 minutes. In that time I will massage the forehead, chin, cheeks and nose especially as my nose is very oily and problematic. My nose is problematic as this excretes a lot of sebum so is more likely to get clogged pores. After massing this neem scrub I will rinse off my face with normal water. And pat dry the skin. This Himalaya scrub has neem which is good for acne prone oily combination skin as neem has anti bacterial properties. There were no reactions or allergies after using this Himalaya Neem Face Scrub. 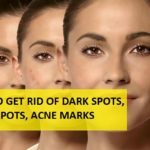 Himalaya Neem Face Scrub is used by all the skin type. The people with oily, combination skin will like the fact that this has neem and the people will dry skin can also try this as this moisturizes the skin and will not dry the face after the use. 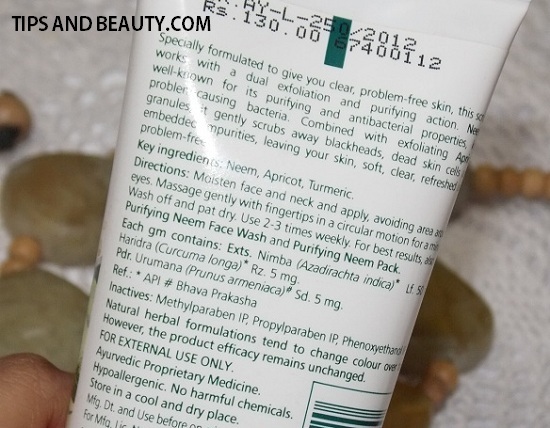 Have you tried this Himalaya neem face scrub? How dis you find it? I think this is very inexpensive product which won’t burn a hole in anyone’s pocket. 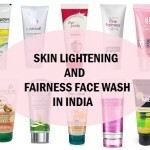 Finally it is ideal for all skin types like dry, oily normal etc. But I only find that, when the skin is oily then the creamy texture can be a bit too much. Other than that this was decent everyday scrub which was not harsh on the sensitive skin too.